From the moment I saw the trailer, I knew I had to see this movie. The visual effects and the sense of movement and flight through a land of dinosaurs was breathtaking. And what I found by the time I finally made it to the theater to see Dinosaur was that this trailer is essentially the opening scene of the film. And it was good. However, then the dinosaurs and other animals start talking. This was perhaps necessary in order for it to be a children's movie, but it wound up having the effect of ruining the mood created by the opening scene. It was cheapened somehow. 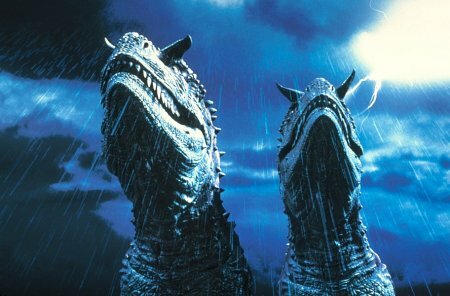 And what is worse is that the character voices didn't quite fit with the dinosaur species to which they were mapped. The worst was the brachiosaur, Baylene. I don't mind the fact that it was a female dinosaur, but a beast of that size simply shouldn't have a soprano voice. They should have gotten a deep-voiced, burly woman at the very least. Once I got past the fact that these creatures would talk, I thought to myself, "Well, OK. So there must be some sort of story here that will be really entertaining for the adults while teaching the kids a great moral lesson." Sadly, however, it turns out that there is NOT much of a plot. 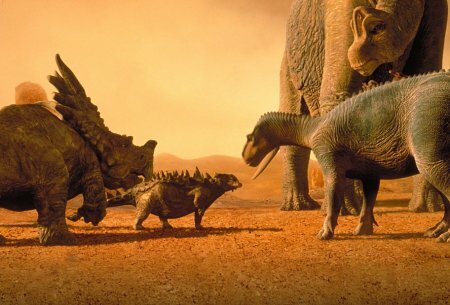 The movie is essentially a migration of a bunch of dinosaurs from a meteorite-stricken, barren land to the "breeding ground" akin to a sort of promised land. b. it is unrealistic that such a motley crew of dinosaur species would travel together (an brachiosaur hanging out with a triceratops and a bunch of other, much smaller herbivores?). c. its underlying motif of "survival of the fittest" meets "sympathy for the weak" was portrayed by oversimplified character types yet the message itself was quite clouded. However, my daughter enjoyed the movie very much. Getting the chance to see dinosaurs roaming the earth (which enchant virtually every child) is something which no child would pass up. What is more is that it is presented in a format suited and intended for children (unlike Jurassic Park, which appealed to the inner child of the adult). It is richly rewarding in that regard. There are some scary parts (such as the picture at the top of the page), but nothing two little hands on the eyes can't fix. 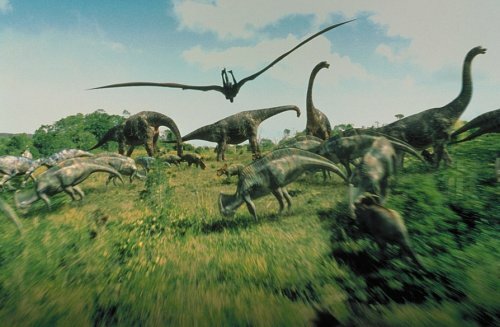 Dinosaur's strong points are its visual effects, sound effects, and music. The visual effects are amazing. These dinosaurs (when they aren't talking) look very real. The computer animation pretty much beats its trail-blazing ancestor: Jurassic Park. The sound effects, particularly in the opening scene, are perfect. And the music (by James Newton Howard) is heroic, foreboding, and inspiring...just as it should be. All of these aspects of the film really hit their peak in the opening scene (part of which is pictured below). It is worth seeing in the theater just for the opening scene, but the bar is raised so high in the beginning such that the rest of the film never really reaches that level again. How would you rate the movie Dinosaur? There have been 104274 people to visit this page since Sun, Jun 4, 2000. And you are the first person to visit this page today!